Home›Columns›Jerry Tyrrell - CPD Academy›Who’s checking the NCC? We need a simple and agreed way of self-assessing and quality assuring building work against the regulations. Jerry Tyrrell pleads for clarity. Journalists are taught to write a ‘hook’ at the beginning of an article to grab the reader’s attention. Gun violence in the United States kills or injures more than 100,000 people a year and causes $1 trillion of societal harm. The millions of often serious construction defects I have seen over 45 years were preventable. No one reads the National Construction Code (NCC) on building sites, let alone the draft of NCC 2019 (Vol 1, 495 pages; Vol 2, 476 pages; Vol 3 – who cares). The Federal Government requires the Australian Building Codes Board (ABCB) to follow it’s ‘best practice regulation’. The NCC is considered by some to be a complex document that can be difficult to interpret by either regular or newer users including students, product manufacturers or home owners. (Extract from ABCB NCC Readability Project). I acknowledge that the NCC is a great concept and is making progress on the structure and ease of access to its content. It is free online. But we are still burdened by tautology we don’t ever read, plus confusion about compliance. Tautology means: Saying the same thing twice in different words, generally considered to be a fault of style (Oxford Dictionary). Repetitious, reiteration, redundancy, superfluity, periphrasis, duplication (Wikipedia). I was invited via email to make comment on NCC 2019, but this is hard to do without spending a lot of time. The elephant in the room is not just the hundreds of thousands of words: it is the three-volume structure and inflexible mindset of bureaucrats and way these documents started out. The ABCB wants its documents to be read and understood. So let’s look at how this can happen. We builders and designers want to comply with the building rules and use the best methods when we build anything. Thirty-five years ago the founding fathers of the Building Code of Australia could not foresee how their information would be used and the way technology could help. So let’s summarise how NCC 2019 should achieve this. This is a good example of the readability and structural problems in the NCC. 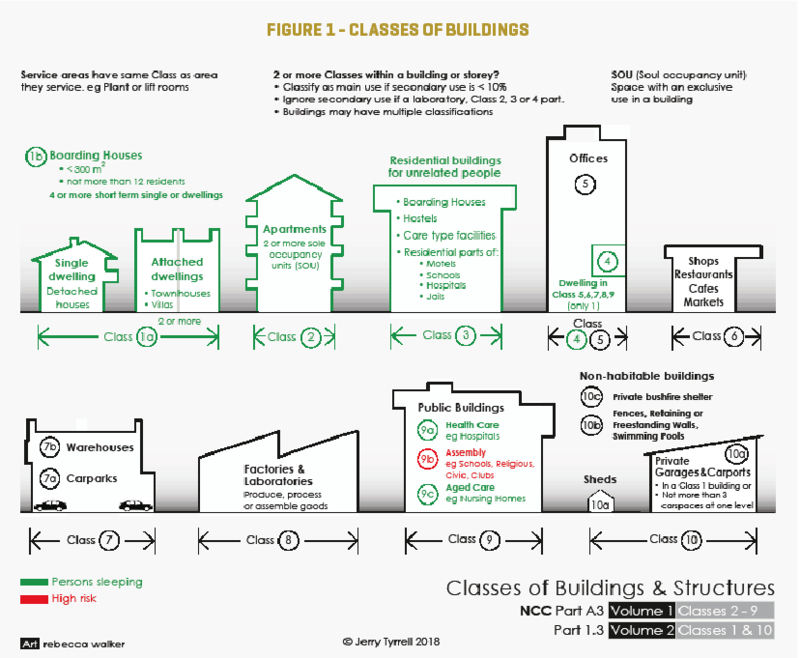 Identical information on the classification of buildings is found three times in separate Volumes. And it is supported by the ABCB’s excellent but wordy four-page summary on its website. I have added a few little things to my one-page diagram. This diagram is a good example of what the NCC can do – summarise seven pages into one annotated diagram. It is more ‘readable’ because of the diagram format. See Figure 1. OK, you are all listening now. But I want everyone looking at pictures that tell us how to build properly. Or, more specifically, seeing best-practice diagrams on our drawing boards or screens and on building sites. The ABCB doesn’t need to ask us to comment on its words. It should be presenting the information more clearly and asking us whether this is better and what can be done to document industry best practice effectively with Standards Australia. If the ABCB does this, its people will like what we say. Jerry Tyrrell is founder of the Institute of Building Consultants and co-founder of Tyrrells Property Inspections. He has more than 45 years’ experience as a contractor, architect and author.